Welcome to our beautiful city of Hamelin! Discover our inns, our monuments and our ... Rats! 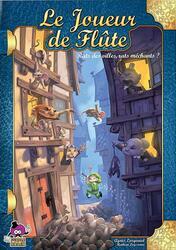 And yes ... Hamelin is invaded by these damn rodents and only the mysterious flute player can help us! Each player embodies a resident of the town of Hamelin who tries to get rid of rats by sending them to his neighbors. When too many rats have settled in a house, its occupants leave it, desperate! The winner is the one who stays at home as long as possible!